With all the votes now in from the 2018 midterm elections, Measure 3 was successfully passed by a majority of voters in four North Dakota counties. 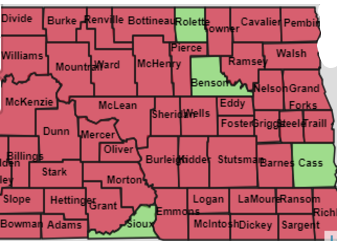 So now, it will be legal for North Dakotans over the age of 20 who live in Rolette, Benson, Sioux, and Cass counties to legally possess and grow the pot for recreational purposes. The remainder of counties in North Dakota will be destined to live in the dark ages until such time as they see fit to join with the four heretofore previously mentioned counties, where it is now legal to recreationally possess and grow the pot.